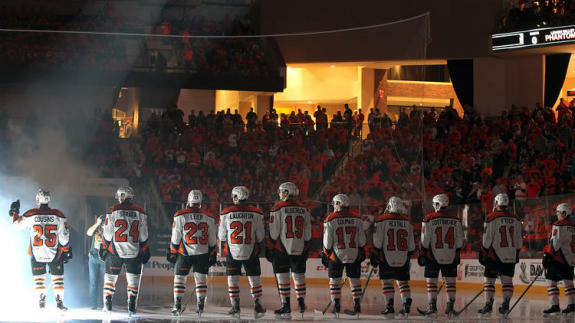 After much waiting, the Lehigh Valley Phantoms skated onto the ice for the inaugural home-opener at the PPL Center in Allentown, PA on Friday night. The official attendance was 8,647 – a sellout – and after walking around the arena last night, it’s clear to see that this is a perfect spot to watch a hockey game. 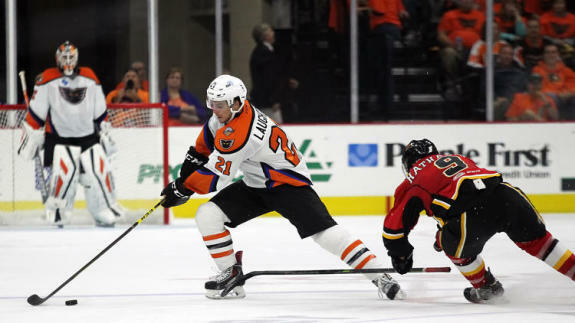 The Phantoms played host to the Adirondack Flames (the city they left to move to Allentown). The game went back and forth before it was ultimately decided by Brandon Manning in overtime. He teed up a slapshot that whizzed by Joni Ortio. For a full-game overview, read Gary Blockus’ column in The Morning Call. The OT win was the 700th victory in Phantoms history. There’s a reason why Rob Zepp was named the starter over Anthony Stolarz. He’s actually a solid goaltender despite not being as well known as Stolarz. Zepp led the Eisbaren of the DEL to five straight championships. In Friday’s game he read plays well, was positiionally sound, and at least two of the three goals he gave up were not truly his fault. Two were on the PK in an undisciplined effort by the Phantoms in the 2nd period. 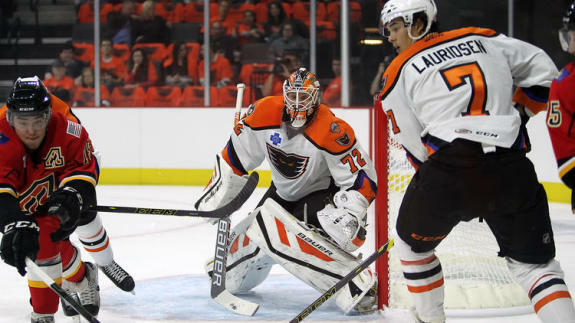 Other than that, he made some tremendous saves – Zepp bailed out the Phantoms defense on two back-to-back saves that could’ve easily given the Flames a two-goal advantage and sealed the deal in the 3rd. Good to know the Flyers have a viable backup goalie (at the very least) in case they need one. A sleeper pick of mine who might get a shot in a few NHL games this season is Petr Straka. He needs to have a big year. For all the skill he possesses, he had a rough go in Adirondack last season, but so did the rest of the team. During the game against the Flames Straka was one of the more impressive forwards. Straka had strong puck pursuit, was difficult to knock off the puck, and had impressive hands. He was able to score a goal in the 3rd period with his quick release on his snapshot that fooled Joni Ortio. With the ‘Brayden Schenn at LW’ experiment currently not going according to plan, the Flyers might be in need of a winger and Straka could very well be that guy. Too much is being made of the Tyrell Goulbourne whenever his name is being brought up. He was a 3rd round selection that Flyers fans are already deeming a ‘wasted pick’. I, too, consider it a wasted pick, but mainly because the Flyers haven’t given him a real shot to prove himself. But there is another 3rd round selection that the Flyers have given every chance to make it and he’s come up flat. His name is Nick Cousins. Yes it’s early in the AHL season, but despite having an assist on Friday, Cousins hasn’t been nearly as productive as I would’ve hoped. He had a promising OHL career, but hasn’t put it together in the AHL, yet. I saw him at the NHLPA Rookie Showcase this summer (plus development camp and rookie camp) and it was clear he had talent, but for a player who is looked at as a pest with skill, the transition has been tough. I’ve been a fan of Robert Hagg since the day he was drafted and still believe he’ll be a great two-way defenseman at the NHL level. At the game he didn’t shine one way or the other. Didn’t play poorly, but also didn’t go above and beyond in trying to assert himself into the game. I spoke will Bill Meltzer of HockeyBuzz a few weeks ago during rookie camp about Hagg. He relayed to me the biggest knock on his game, even from his draft year, is that he never tries to reach that other gear and test his abilities to the fullest. He’s content with his style and that’s exactly how he played. I’d venture a guess that Brandon Manning is going to be the first defensive call-up for the Phantoms based on having the most experience. He did score the game-winning overtime goal on Friday night on a blast from the point, but he also did have a lot of blown coverage in the defensive zone throughout the night. He’s not big, but he’s stocky and moves well for someone with that build. Personally, I think Mark Alt should be the first call-up. He is by no means flawless, but as a tall, rangy defensemen he hustles, lays hits, and cuts down passing lanes. His offensive instincts weren’t prevalent, however, Alt had an active stick and blocked more than his fair share of shots. Scott Laughton was the best player on the ice – both for the Phantoms and the Flames. He scored two powerplay goals that kept Lehigh Valley in the game, but those were mostly due to being at the right place at the right time. It was his even strength play that impressed me. He knows what to do, where to be, and what risks to take in order to allow the Phantoms to remain on the offensive. Rarely did you see the Phantoms in the defensive zone when he was on the ice. Laughton is already too good for the AHL and should be given a shot on the Flyers. Unfortunately, there is a logjam of centers on the team and there isn’t much room for him to play and showcase his talents. Even if he is called up, he’s best suited on the 3rd line, not the 4th line where he will likely end up. If you’ve read any of my thoughts on Jesper Pettersson during development camp and rookie camp, you’d know I am one of his biggest supporters. I would have liked to see him get more opportunities throughout the game, but I can see why Alt, Manning, Gostisbehere, and Hagg played most of the minutes. But even in his limited minutes, Pettersson kept his game simple and played well. Only 5’10”, Jesper throws his weight around like Mack Truck. During the 2nd period he caught Sven Baertschi with his head down and completely laid him out. As much as I’d like to see him on the Flyers, he’s got a long list of defensemen he has to beat out, but I wouldn’t put anything past this kid. I was skeptical of when Ron Hextall signed his son to the Phantoms. I felt it was more a charity contract than anything else, but it’s far from that. I’m not entirely sure he has a long NHL career ahead of him, but Brett has the defensive mindset and bullish style of play that makes him a tough competitor. He’s an asset to have on the PK and doesn’t go quietly. Hextall has that fire in his eyes (probably got it from his father) and the desire to do what it takes to win. He did a superb job in the defensive zone and keeping the Flames at bay on the PK. The kid everyone wants to talk about is Shayne Gostisbehere – and for good reason. The Flyers haven’t had a defenseman with his talent in at least a decade. Eric Desjardins was one of the best to play for the Orange and Black, but even he doesn’t hold a candle to Gostisbehere’s potential. He’s eager to make a play whenever he has the puck on his stick. Still, he needs to be able to play some sort of competent defensive game if he wants to sniff NHL action anytime soon. While his presence in the defensive end isn’t a total train wreck, there is still much work to be done as he pinches too frequently and gets caught out of position. If you’re going to have someone coach Shayne to be more responsible in his zone, Terry Murray is the guy. Murray also knows that Gostisbehere will never be a defense-first blueliner and wants to play to his strengths. Murray on Ghost’s game: “Not bad. I’ve had some players who played on the edge on the backend. They’re Al Iafrate and Paul Coffey and PLEASE don’t compare those guys. That’s not what I meant. It’s just those kind of players that play on the edge. A lot of times their defense is they’re skating back into their own end and pressuring from behind using sticks, chipping pucks off blades of sticks and I see that in his game and that’s OK. I’m not going to change that. I want to encourage the big stuff from this kid because he’s got some big stuff in him.“When our team has the puck he excels. He’s really explosive. He’s very quick. He has incredible quickness – two strides. His hands are very quick. He pulls the puck from one side of his body to the other as good as most people you’re going to see. What I love for a player who has really good puck skill is he’s got a shot-first mentality – “I don’t care who’s out there…I’m shooting the puck”. And he’s got a really good, heavy, accurate shot that he gets through to the net.